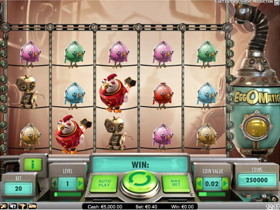 A New Netentertainment Slot Game with comical animations of chickens raining golden coins down the reels, this video slot is everything it’s cracked up to be. EggOMatic has 5 reels and 20 pay lines. A Spreading wild Egg, Free Spins Egg, Coin Win Egg and a Surprise Egg are all part of the great experience. Players anxiously wait to see which eggs will land on the Wild Rooster below to reveal the prize hidden in the egg.